Natural range Wide area of Eurasia. E Europe to E Asia. Natural range in Japan may be entire Honshu, Shikoku, and Kyushu Islands, but details are unknown. Habitat Middle to lower area in large rivers, lakes, and ponds. Range in Japan Hybridization between native and introduced populations should occurred given that artificial introduction of this species within Japan have occurred since old period, and carps from foreign country have been introduced in wide area since Meiji Era (since 1867). Origin WIthin Japan and from other countries. Route Deliberate: For ornament, etc. Impact In almost part of Japan, hybridization with native carp populations. In foreign countries, damages on freshwater plants and invertebrates by predation, water degradation and increase of nutrients by resuspension of sediments, competition with native fishes including fishery resources such as perch. 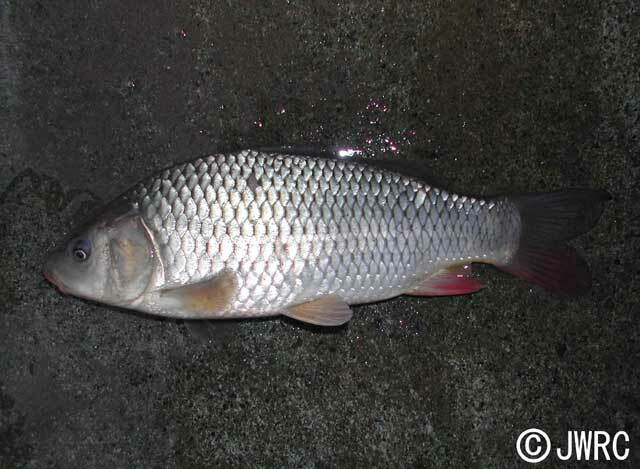 Affected organism: Native population of carp, in Japan. Entire freshwater community, in other countries. Introduced range in other countries Worldwide. Wide areas of Asia, Europe, Africa, N, C, & S America, Australia, and many islands (Philippine, Sri Lanka, Indonesia, New Guinea, New Zealand, Guam, Hawaii, Cuba, Dominica, Mauritius, Madagascar, Azores, etc. ).